Jennifer Choi, vln, Esther Noh, vln, David Wallace, Vla, Alex Waterman, Cello, Satsohi Takeishi, Japanese Percussion, Ben Vida, Modular Analog Synthesis, Miya Masaoka, koto, composition, Michelle Handelman, visual projections. 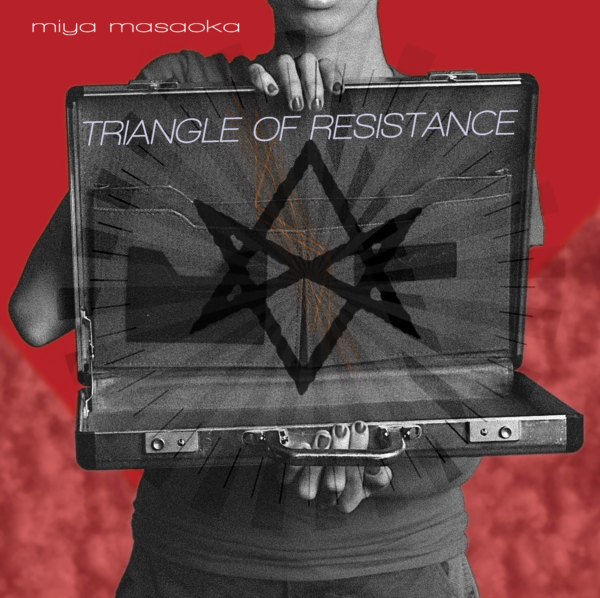 “Triangle of Resistance” references histories of oppression and resistance – the 1942 US executive order 9066 – the order that authorized internment of Japanese American citizens during WWII, the Russian Revolution, and symbols of female activism. Michelle Handelman works with many sources to create imagery inspired by Russian Constructivism with a punk dissonance. These images themselves resist control, and work in antagonistic ways with the sound. The abstractions are of a distant darkness – smoke, dirt, fear and vulnerability – evidence of a life lived under duress and under the radar. The music, composed by Miya Masaoka and performed by a stellar ensemble conducted by Richard Carrick, combines a fragmented modernity with particular approaches to temporality, gesture and noise, and draws from the experience of the Japanese American camps that detained both her parents. The nearly hour- long performance will at times be comprised of the entire ensemble, and also smaller configurations of musicians. The occasional use of harsh florescent lights will reference blackouts, brownouts, dystopia, and themes of interruption. Masaoka is honored and delighted to once again work with Richard Carrick, and to follow up on Masaoka’s piece, “The Dust and the Noise” which was performed by Either/Or for their festival in 2013. Miya Masaoka resides in New York City and is a classically trained musician, composer and sound/installation artist. She has created works for mixed choirs, Japanese instruments, and most recently her first symphony was performed by the La Jolla Symphony in California. In her pieces, she often works with spatialization and sonification of data, mapping the behavior of plant, brain activity and insect movement to sound. Her work has been performed throughout the world including the Venice Biennale 2004, the Miller Theater, NYC, Merkin Hall, V2 (Rotterdam), Ircam, (Paris), KunstRadio (Vienna ), Radio Breman (Germany), Yerba Buena Center for the Arts (San Francisco), The Walker, Chicago Art Museum, and festivals including Moers (Germany), Victoriaville (British Columbia), Siggraph, Yokohama, Japan, Other Minds Festival, Redcat Theater (USA), and the Centre for Contemporary Art, Warsaw, Poland. She has received the Doris Duke Artist Award, the Alpert Arts Award, the Map Fund, Asian Cultural Council Japan Fellowship, a Wattis Fellowship, a Gerbode Fellowship among others. Since 2003, she has taught at the Music/Sound Department of the Milton Avery School of the Arts at Bard College, and was an invited guest lecturer in Music Composition at NYU in 2012. Michelle Handelman (video projection) is a video artist, filmmaker and performer. Her most recent project Irma Vep, the last breath, a 4-screen video installation based on the silent film character Irma Vep, is on view at The Eli & Edythe Broad Art Museum through January 2014. Beware the Lily Law, her public art project on transgender inmates is now in it’s third season at Eastern State Penitentiary in Philadelphia. Previous projects include Dorian, a cinematic perfume, based on Oscar Wilde’s The Picture of Dorian Grey which premiered at Participant, Inc.(NYC, 2009) and traveled to MIT List Visual Arts Center (Cambridge, 2010); Arthouse at The Jones Center (Austin, 2011); Art-Claims-Impulse (Berlin, 2011); Guangzhou 53 Art Museum (Guangzhou, 2012); Dirty Looks Queer Screenings Series (NYC 2012) and Vox Populi (Philadelphia, 2012). She is the director of the feature documentary BloodSisters (Bravo Award 1999), now in distribution by the Tribeca Film Institute’s Reframe Collection and was chosen by Bloomingdale’s for their fall art campaign. Handelman is a John Simon Memorial Guggenheim Fellow and has been awarded grants from The Map Fund, New York Foundation for the Arts, and the Experimental Television Center. She is an Associate Professor at The Fashion Institute of Technology and is currently developing their new Film and Media program. Richard Carrick: born in Paris of French-Algerian and British descent, is a New York based composer, pianist and conductor. His music, described as “charming, with exoticism and sheer infectiousness” by Allan Kozinn of The New York Times, has been performed internationally by ISCM World Music Days-Switzerland, Vienna’s Konzerthaus, the New York Philharmonic (Ensemble Series), Darmstadt Summer Festival, Tokyo International House, Nieuw Ensemble, JACK Quartet, Nouvel Ensemble Moderne, soloists Tony Arnold, Magnus Andersson, Carin Levine, Rohan de Saram, and others. Brooke O’Harra (director) is a free-lance director. She is also co-founder (with composer Brendan Connelly) of The Theater of a Two-headed Calf and has developed and directed all of their productions. Her most recent Two-headed Calf production the opera project You My Mother had two runs in NYC, one in 2012 at La Mama ETC and 2013 in the River to River Festival. Brooke also directed, wrote for, and performed in the Dyke Division of Two-headed Calf’s live lesbian soap opera ROOM FOR CREAM. Brooke is currently working on several projects: two performance projects with her partner Sharon Hayes: Times Passes (The Performing Garage, NYC) and Act Two (The Stedelijk, Amsterdam), a new musical with Lisa D’Amour and Brendan Connelly using Jack Spicer’s Billy the Kid poem, and an independent project beginning in April 2014 while in residence at the New Museum for Contemporary Art in New York City titled I am Bleeding All Over the Place: Studies in Directing or Nine Encounters Between Me and You. She is an assistant professor at Bates College. Special and huge gratitude and thanks to Elisabeth Beaird and Circuit Network, Pamela Z, George Lewis, Matthew Ostrowski, Rex Chen, Jim Staley and the Masaoka Family. To read more, go to the blog, Roulette. Interview….blog…..etc. This project is supported by the MAP FUND and the Doris Duke Charitable Foundation.